As a means of discovering the history of a community, a local museum can’t be beat. We recently visited my husband hometown in central Texas. After graduation from college, he moved away to pursue a career with the Forest Service. 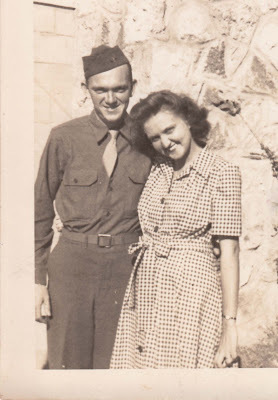 Returning periodically to visit his parents (see photo at left of them as newly-weds) who resided in Gatesville, com-ing home now everything seemed different. New structures had replaced many familiar landmarks including his junior high school, and his dad’s drugstore is now a realtor’s office. Forty-five years after graduating from high school, few of my husband’s schoolmates still live there. Most have moved away. It was in the local museum that we were able to discover the essence of the small town he remembers. Surrounding the colorful stately Coryell County courthouse are many old abandoned stores. In one of them, several prominent residents have established a historical museum to display local artifacts including a photo exhibit of the town when the business district was in its prime. A partial soda fountain bar with stools from my father-in-law’s drugstore where my husband worked during his youth brought back fond memories. A photo of his uncle who was one of the founders of the local medical center, and early equipment from a local doctor’s office documented the progress of the Gatesville community. A military section with uniforms from foreign wars sadly included a photo of a schoolmate who was killed in the Vietnam War. Because Texas is cowboy country, there was an extensive spur collection donated by a former teacher. An antique wagon that delivered ice blocks to families before they had frigs was a contrast to newer inventions that were displayed: an electric refrigerator, a telephone keyboard, a small rural post office with individualized mailboxes, early black and white televisions, and a mangler ironing machine used to press sheets, pillowcases and table cloths. A Singer treadle sewing machine, a spinning wheel, loom, and a large butter churn helped recall earlier times. An old country store just like the one his grandparents had in a nearby rural community was complete with a gasoline dispensing pump, farm implements, an old cash register, glass milk bottles, and a Coke machine to chill bottled pop. How interesting to look in the old yearbooks for photos of his family members as both his grandmother and parents had attended local schools. 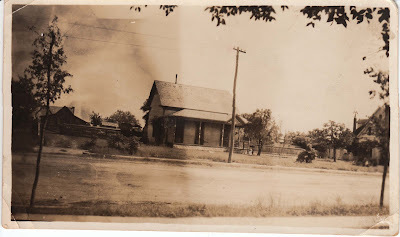 (Photo at right of my husband's great grandparents Winfield's home in Gatesville.) A fun trip down memory lane preserved by some thoughtful citizens of his hometown. Ahhh, that's great!!! Grandmommy took me to a clothing shop down by the courthouse when we first moved to TX. I have great memories of Gatesville. Neat old photos and family narrative. And that spur collection would sure be something to see!! A spur collection? That must have been quite a sight. You make an excellent point, Lin. We have a few local museums around here in western Connecticut, and they are full of great stuff. One museum is big on collecting oral histories. Talk about a resource! This brings back memories of my own childhood and our town. Small towns do have a way of changing...almost to the point that not much is recognizable anymore. You have to have lived there to know how the town is different. Thanks for the memories. I miss old towns! I miss the tiny local theaters and candy shops and dime stores. And I love the local museums and the dedicated volunteers with rich memories and stories to share. Great post. Helps us all appreciate those who've made the effort to preserve some of the past for future generations to oohhh and ahhhh, and "What the heck is that?" over. I love this picture of them! Grandaddy died when I was around 9 or 10, it's good to see him young and healthy. He always had the rheumatoid arthritist when I knew him. And Grandmommy looks so young! I remember going to the drug store, and buying a small red stuffed mouse.